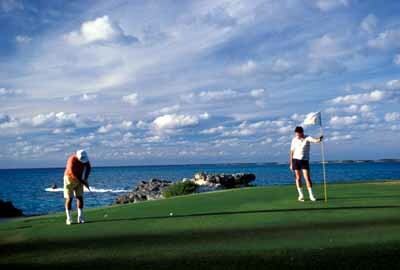 Golf is not only taken seriously in Bermuda, it dominates much of the 21-mile, long narrow landfall. Amazingly, tiny Bermuda has 7 golf courses, more courses per square mile than anywhere else in the world. The remarkable terrain has something to do with it. Ocean views, nonexistent on most courses, are common in Bermuda. The underground caves under most of the islands create undulating, rolling greens. Surrounded by scenery characteristic of formal gardens and an ocean breeze that creates an unpredictable wind factor, Bermuda’s courses are known for their unusual beauty and challenge. Which explains why tiny Bermuda is host to both professional and amateur tournaments like the PGA Grand Slam of Golf, Bermuda Goodwill Golf Tournament, the Bermuda Open Golf Championship and the Goslings Invitational. Tournament schedules are available from the Bermuda Golf Association. Most courses book advance tee times. Hotels and guest houses can assist guests directly. Bermuda Government golf courses (Port Royal and Ocean View share an automated reservation system: (441) 234-GOLF. Or book online 60 days in advance at www.bermudagolf.bm for the two courses owned by the government. Proper golf attire is mandatory. Shirts must have collars and sleeves. Shorts must be at least Bermuda length, ending just above the knee. No jeans, gym shorts or cut-offs allowed. Caddies are available only at Mid Ocean. Use of carts is mandatory at Belmont and Fairmont Southampton Princess every day and on weekends and public holidays at Port Royal and Ocean View. All courses rent ladies’ and men’s right- and left-handed club sets. Most offer lessons. Balls cost around $50-70 per dozen. Credit cards are accepted. MasterCard and VISA are accepted at all seven courses; American Express is accepted by most. For a minimum of 20 players, most courses will accommodate groups in advance. Special group rates are usually available.